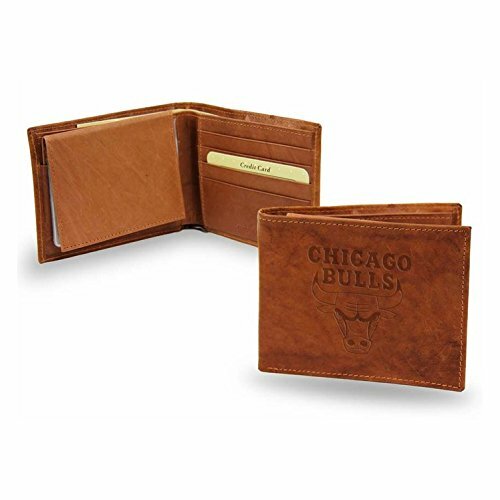 Rico NBA Chicago Bulls Official NBA Leather Billfold Wallet by Rico at Basket Express. MPN: MBL72005. Hurry! Limited time offer. Offer valid only while supplies last. This officially licensed embossed genuine leather cowhide Billfold wallet by Rico Inc. Is a wonderful way to carry your team spirit with you. This officially licensed embossed genuine leather cowhide Billfold wallet by Rico Inc. Is a wonderful way to carry your team spirit with you. Embossed with an official licensed team logo. This wallet makes a great gift for the sports fan in your life, and has a plastic photo holder, and room for your credit cards.